Trio bamboo serving tray. Eco-friendly deluxe bamboo serving tray. 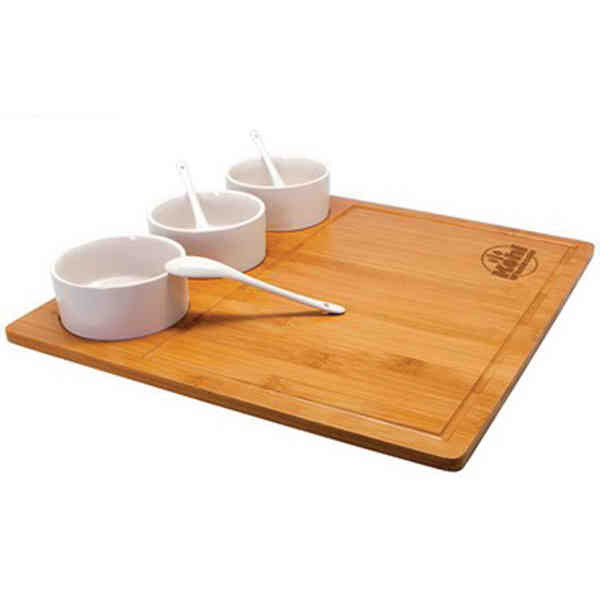 Gourmet set includes a large 13" x 13" serving board and three ceramic 3.5" diameter bowls with ceramic spoons. Perfect for entertaining. Size: 13 " x 13 " x .4 "
Imprint Size:1 1/4" x 2"
Ship Weight:22 lbs, 22 lbs per carton of 6 pieces.